AnonD-25436, 09 Aug 2012Is anyone in India able to login to wazapp successfully.? it gives error always tried with man... moreyes, i have successfuly registered with wazapp, i too had installed the latest wazaap, but i found it more interesting but very buggy, so i reverted back to my old wazaap 2.6.
i'm a new user of N9, my friend pass me a vedio mp4 format via bluetooth in his samsung phone andriod os, after i recieve it to my N9 I play it, but unfortunately it appears a message says " YOU CAN'T PLAY THESE TYPE OF FILES ON THIS DEVICE" my question is, why is'nt N9 plays mp4 format but i have some mp4 format video that plays? PLZ help me!!!!!! Is the production of N9 still ongoing or has stopped? Is anyone in India able to login to wazapp successfully.? it gives error always tried with many numbers.. Ruplee are you able to connect to whatsapp via wazapp? anybody else? Is there any lamination needed on N9 to stay away from scratchs...? @Ch.Saqib, tanx for ur advice i think i will go for N9. I hope production has not stopped. Ofoni, 09 Aug 2012Pls can i use mobile9 or other websites to download Apps in Nokia n9? Can i also use opera min... moreN9 has 3 browsers. Native Nokia browser, Opera mobile 12 and Firefox 14 which supports flash player as well. Any website can be open and non-store apps which supports MeeGo OS can be downloaded and installed. More MeeGo devices coming from Jolla. 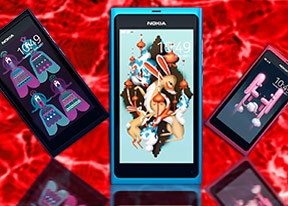 But Jolla will not support N9. But when more MeeGo devices come to market, more apps will come to N9 also. If you want to enjoy something different then N9 is good. But you will not get much support from Nokia. There is a great community of great great people who are supporting N9. Pls can i use mobile9 or other websites to download Apps in Nokia n9? Can i also use opera mini browser in N9? TT, 09 Aug 2012Meego now in Jolla's hands, no problem goingforward.yolla does not and will noot support existing Meego devices like N9 and N950, other than building new phone and that posibly modified OS or because of interests and finances they might easylly fail and disapear...hope is a hope, but possibilities are critical...so don't lie people. Ofoni, 09 Aug 2012Pls can one use other websites like mobile9, Nokia store to download apps into N9 or it uses i... moreMeego now in Jolla's hands, no problem goingforward. Pls can one use other websites like mobile9, Nokia store to download apps into N9 or it uses its N9 ovi store only? Finally, is it wise to buy the N9 phone now since there is no more support for Meego OS. if you are new to smartphones go for 701, otherwise if you are big dreamer on aisland and like typing in DOS and coding than N9 is the one.